In the 1930s, a number of Iron Age dwellings were excavated on the moorland of Skørbæk Hede. A small cluster of farmsteads, from around the time of the birth of Christ, were ranged in the middle of an extensive system of small fields covering an entire square kilometre. The low boundaries that separated each field plot were still visible because the site was abandoned in the early Iron Age and since then had been given over to natural moorland. 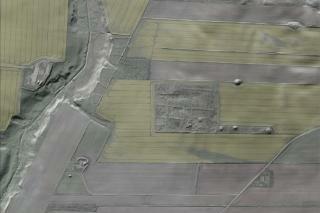 This offered a unique opportunity to map a complete agricultural landscape from this period. Most of the area is now under cultivation, but in the listed moorland around the Iron Age dwellings, the field boundaries are still prominent in the landscape. Have you visited / Want to visit? The year is 1937. The rays of low sun coax Iron Age fields to grow out of the moorland. The field boundaries cast a web of dark shadows on the heather-clad hills. Archaeologist and cultural geographer Gudmund Hatt joins his assistant in admiring the results of the day's work: cleaning of the carefully laid paving stones between and around the dwellings of the Iron Age village. The crowning achievement of 10 years' work in a race against the merciless conversion of the Jutland moors into modern farmland. At countless locations they have excavated well-preserved Iron Age houses, measured and mapped Iron Age fields. But a whole village in the midst of a complete field system – amazing! Contribute with a story about this place? Every time you recommend, visit or comment on posts or stories appears in the stream.